SouleMama: "Bird With a Hat on His Back"
"Bird With a Hat on His Back"
That's the title of this new piece of art that was hung at our house this weekend. A collaboration between Ezra and I, that was meant to be a companion of sorts to a similar one I made for Calvin a few years ago (really? years? oh my, it's flying by). I cannot tell you how much pleasure I've had watching each of my babes come to art in their very unique and personal ways. 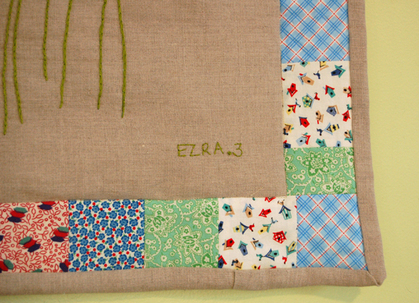 Ezra, my fellow lefty - very free form, and abstract and imaginative. Calvin - so precise and always exact, quick, and imaginative in a quite different way. Calvin wouldn't draw anything unless he could make it appear as he thought it 'really' did look. Ezra, on the other hand, will draw a grey circle in the middle of the page and call it, "an ice cold pizza on a snowy day, and I'm hiding in the snow with my friend Simon and a scary monster, and the sun is shining bright." My realist and his brother the abstract. Makes for some interesting conversations between the two of them, let me tell you. So this is Bird with a Hat on His Back, and I love him. I love all the legs that are on all of Ezra's drawings. And watching him add all those legs is the best - he'll just keep adding and adding and searching for spots to squeeze just one more leg. 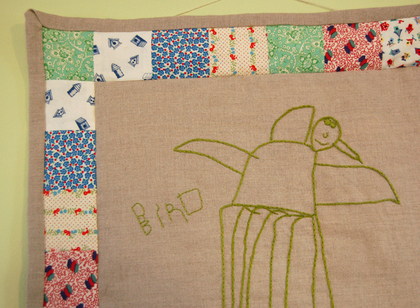 He's had an explosion of drawing lately, and I'm gradually collecting a few of my favorite creatures to make him his very own drawing quilt like his brother's. 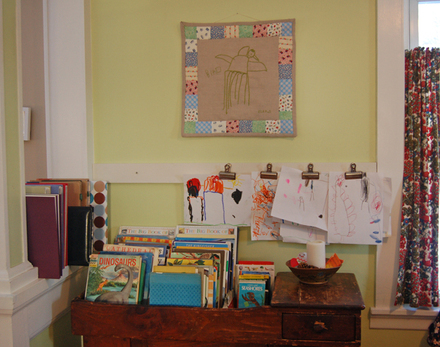 But for now we have this piece, hanging in our dining room (which doubles as our art room, game room, and reading room. It's cozy. Even with that green paint that is so painful to photograph against. Sigh.). 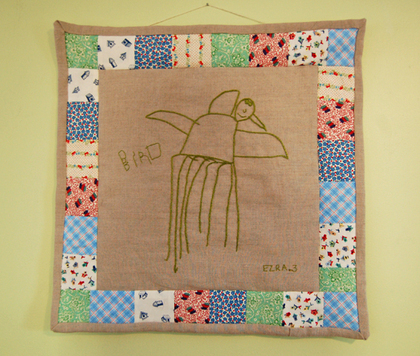 As for the process, I embroidered on linen (using transfer paper to trace his drawing and letters), used patchwork pieced edges, and quilted it. Backed with linen, and a linen binding (linen as binding was kind of a hassle, I must admit). I handsewed a strip of bias binding on the back to slide a dowel through for hanging. You know, I've done enough work with their art by now that I would think they'd tire of it, or atleast be nonplussed by seeing it around. But, blessedly, the look on Ezra's face when he saw this on the wall was just the one I hope for - pride in himself and his 'art', with a love-smile tossed my way. Success.